This alien thing was a rather surprising find in the garden surounding the frog pond! 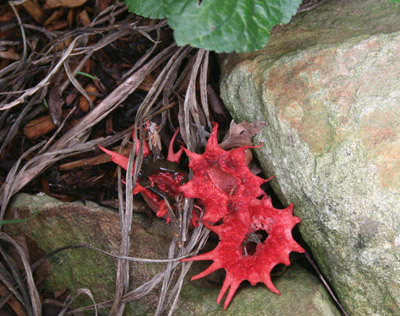 After a bit of searching through books and fungi sites on the Internet, it had a name. 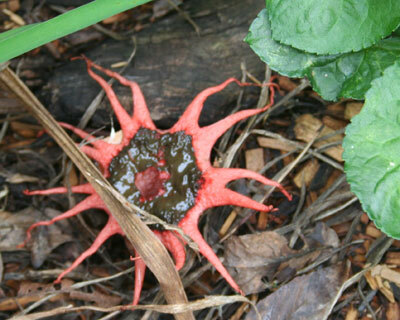 Commonly referred to as Starfish or Anemone Fungus, they love moist mulched gardens. Both these conditions have only recently been satisfied – new mulching around the plants and we’ve had quite a bit of rain. I’ve never seen such a weird thing in any garden anywhere. Apparently, these fungi produce spore slime, which has an intense smell of rotting meat or sewage. Now I was not going to put my nose anywhere near this brown gooey mess as seen below but I can tell you the flies and insects love it.